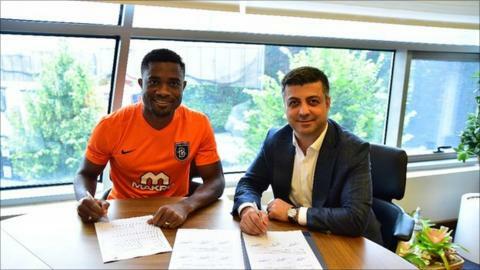 Istanbul Basaksehir have announced the signing of Cameroon defender Aurelien Chedjou on a three-year deal. The 31-year-old Indomitable Lion has opted to join the 2016/17 Turkish top flight runners-up after reaching the end of his contract with city rivals Galatasaray. Chedjou, who has 50 international appearances for Cameroon and played at the 2010 and 2014 Fifa World Cups, moved to Turkey in 2013 from French club Lille. The centre-back made 119 appearances and scored 12 goals for Galatasaray during a four-year stint that saw him win the league title in 2015. He also won an unprecedented three straight Turkish FA Cup titles in 2014, 2015 and 2016 as well as three Turkish Super Cup in 2013, 2015 and 2016. Istanbul Basaksehir shocked Turkish football by finishing second behind Besiktas in the league and emerging runners-up in the Cup final last week. They will compete in the Uefa Champions League third qualifying round, whilst their more illustrious city rivals and Turkish football giants Fenerbahce and Galatasaray play in the second-tier Europa League.